The FKM Boning is manufactured by Fujiwara Kanefusa. The blade is made with a mono steel construction of Molybdenum/Vanadium stainless steel. It is hardened to an HRC rating of 58-59. This steel/hardness combination takes and holds a razor sharp edge. The asymmetrical blade has a grind of 70/30. It also has a convex curve on one side and a flat profile on the other. The Fujiwara Boning is a slightly less exaggerated version of a Honesuki. Think more radius, less angle. A popular knife primarily employed for the boning of poultry and meats as well as frenching chops etc. Its triangular shape and sharp point allow it easy access to tight spaces. The tall rear (40mm) end give it strength and a rigid and strong feel. Completely unlike its western boning knife counterpart. 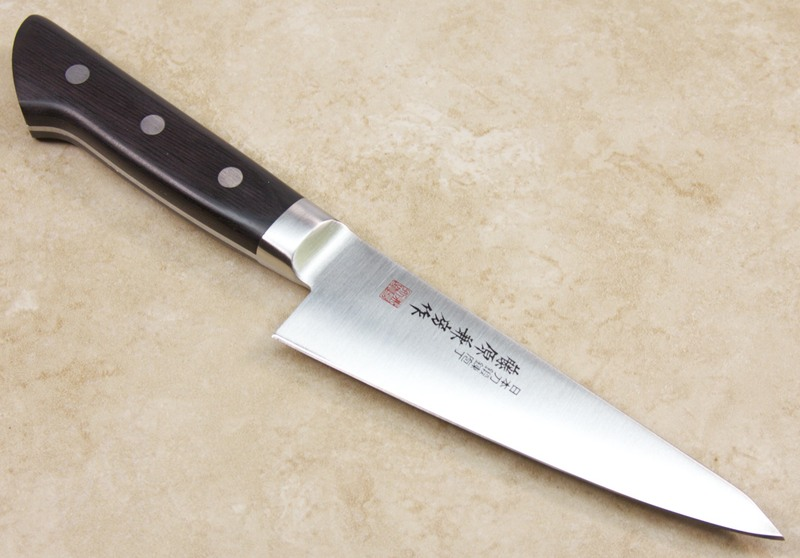 But it is also a viable slicer and chopper with its gentle but nicely curved edge. A rockers knife. This knife really is a pleasure to use. It�s easy to sharpen. It feels good in your hand (especially pinch grip). It is well balanced and it can get very sharp with little effort and hold that sharpness for a good while. Buying speciality knives can get expensive. This is a great way to get a really well made, fun and effective Japanese boning knife at a truly bargain price. Grandson loved this item. He loves to cook and was excited to add this knife to his collection. 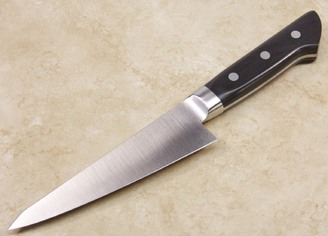 This knife is extremely sharp and perfect for boning as well as small knife work. Excellent value as well as a great introduction to Japanese knives for new cooks. Beautiful, well-balanced knife that is a pleasure to use. Although it is designed to break down meats, it performs equally well on vegetables. A great value for the price. I break down cases of chickens daily and this is my go-to. This knife will get a lot of use and not just for chicken fabrication. At that price I don't think it can be beat for quality and versatility--the only smaller knife I use anymore. Solid fit & finish, spectacular grind--everything seems to just fall away from the blade. Only the out of box sharpness was unimpressive. Initially I was disappointed since I've never owned a knife with an asymmetrical bevel before, something like 80/20 if not 85/15, and was concerned about sharpening. I had hoped to use it a bit before I had to cross that bridge but it wasn't anywhere near sharp enough to bone a chicken with. I might have deducted a star for that except that I easily and quickly got it very sharp--even though I am hardly an expert sharpener. Highly recommended without reservation. I purchased this knife as a replacement for my victorinox boning knife, and it has not disappointed since I received it. Brilliant design, very light and good for hours of butchery, I'd also like to note that I ordered it on a Monday, it arrived on the Wednesday, and I'm in UK! I would recommend this knife to fellow chefs. This is a fantastic knife. Not only a great boning knife, but I have been using it as my go to utility knife. It's perfect for cutting up raw potatoes, they don't stick to the knife at all. This is my new everything knife...love it. For the price, this knife is more of a work of art when you cut through anything. It sharpens quickly and is a great go- to knives in my entire collection. This knife is amazing! Not only a great boning knife, but it is the perfect utility knife! I have used this knife for everything, even fine detail work. Love, love, love this knife. I bought this knife only to add a honesuki to my collection. Wow! F & F are average, but it has a hamaguriba (convex blade profile) and excellent OOTB sharpness. Lamb chops seem to peel off the rack instead of being cut off. Chicken bones seem to rise out of the meat by magic. Do not hesitate to buy this knife. Great knife, very stiff, good wieght in the handle. As far as values go, it's hard to beat. Only thing I would change is to offer a version in Carbon steel for those who prefer it. Again the fujiwara FKM series amazes me for the value. a true bargain. This boning knife came with a very good factory edge. I didnt sharpen it until I had cleaned 50 chickens. When I did sharpen it I was thrilled by the edge it took. For the dollar spent, maybe the best knife I have ever purchased.